A single storm event can change the shape of a sandy beach dramatically, but beaches also exhibit a remarkable ability to recover. 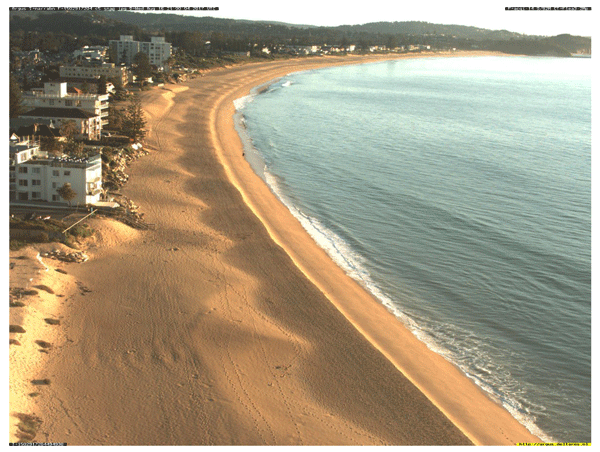 So how important are storm-driven changes to a beach in the long term? This question affects predictions of future shoreline change. Here we explore signal shredding – when sediment transport erases any signature of outside driving forces. Our results suggest that major storm impacts may tell us little about long-term shoreline change and vice versa. Rivers can raise or lower their beds by depositing or eroding sediments. We combine equations for flow, channel/valley geometry, and gravel transport to learn how climate and tectonics shape down-valley profiles of river-bed elevation. Rivers steepen when they receive more sediment (relative to water) and become straighter with tectonic uplift. Weathering and breakdown of gravel is needed to produce gradually widening river channels with concave-up profiles that are often observed in the field. We present in this mostly theoretical contribution a systematic treatment of tracer particle mixing in soils. We elaborate the consequences of rarefied (non-continuum) conditions of transport and mixing, and we augment this with numerical analyses that reveal important information not readily apparent in the analytical formulations, including an illustration of the variability in 10Be concentrations and OSL ages of individual particles in soils, with implications for interpreting field data. Deltas are important landforms because many people live near them. Specific water flow patterns of spreading and contraction are produced where delta channel flow meets the ocean. Tracers on the water surface allow this pattern to be measured from space. We identify this pattern on a growing river delta in 40 years of images, allowing us to track its growth in a new way. This method has potential to improve monitoring of deltas worldwide. Barrier islands change through time and space in response to natural and human forces. This paper shows that barrier island development and the beach–dune system can be influenced asymmetrically during island development by ancient and buried river valleys that cross the modern barrier island. Given the importance of the natural environment, coastal management projects should first seek to understand how the island developed in order to more effectively balance natural and human pressure. 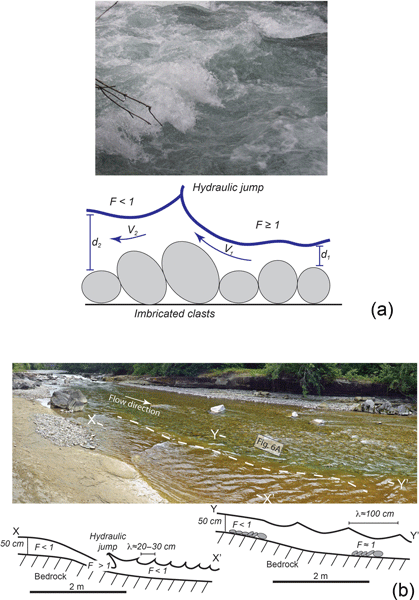 The transport of pebbles in a river is smooth and continuous under high flow conditions but under typical flows becomes erratic and unpredictable. We perform experiments to learn more about the origins of this unpredictable, intermittent behavior. Our results show that this unpredictability is similar to how infrequent avalanches occur in a sandpile. Transport events are similar in size but become more infrequent and erratic as the river transports less and less sediment. We used a numerical model to study how mountain streams adjust to series of sediment input events, e.g., landslides. We recreated flume experiments with similar scope and then expanded their parameter space, allowing us to find conditions under which the stream becomes overloaded with sediment. This occurs when the stream cannot evacuate a sediment input in the time between pulses. Our results can help to better understand the long-term adjustment of mountain streams to episodic sediment supply. The grain-size distribution of ancient alluvial systems is commonly determined from sections of gravel deposits exposed vertically to reconstruct paleo-environments or changes in tectonics and/or climate. To test whether such a grain-size distribution is equivalent to one of the sediments that was in direct contact with the flow at the time of deposition, we dug a large trench in an active gravel-bedded, braided river. We show that the granulometry is uniform at the scale of the active layer. 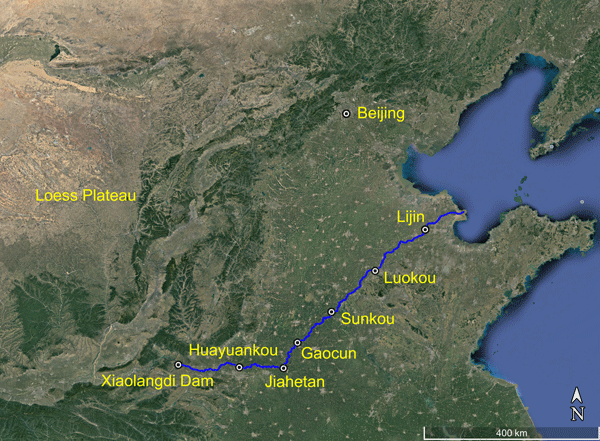 Morphodynamic model of the lower Yellow River: flux or entrainment form for sediment mass conservation? 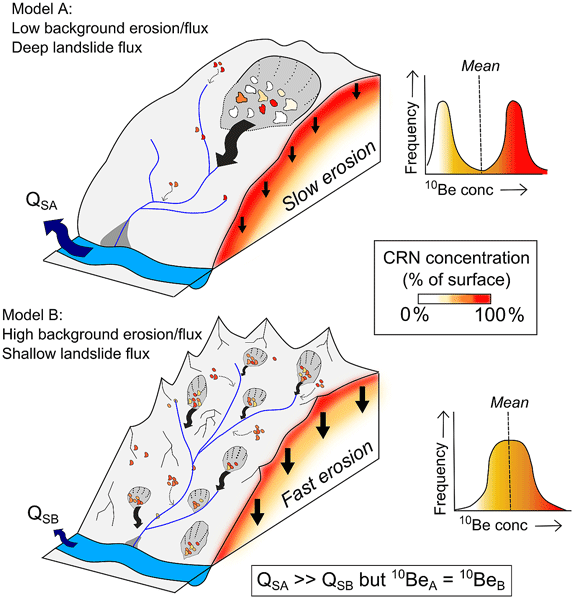 In most models of river morphodynamics, sediment mass conservation is described by the Exner equation, which may take either the flux form or the entrainment form. Here we compare the two forms of the Exner equation under conditions typical of the lower Yellow River. We find that when using a single sediment grain size, there is little difference between the two forms. But when considering sediment mixtures, the two forms will show very different patterns of grain sorting. Rainfall-induced landslides cause significant damage and fatality worldwide, but we have few datasets constraining the impact of individual storms. 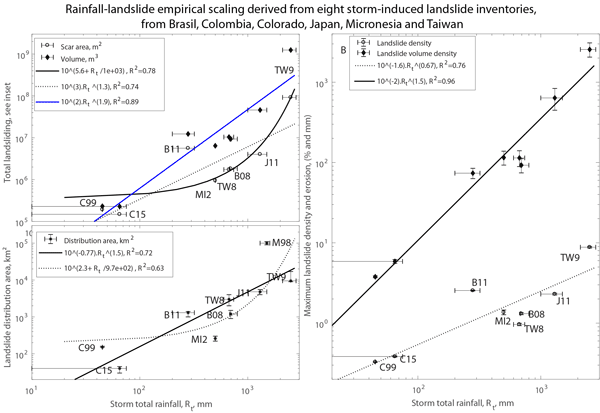 We present and analyze 8 landslide inventories, with >150 to >150 00 landslides, comprehensively representing the landslide population caused by 8 storms from Asia and the Americas. We found that the total storm rainfall is a major control on total landsliding, landslide size, and that storms trigger landslides on less steep slopes than earthquakes. We mapped landslides (> 100 m2) in the Nepal Himalayas due to 8 monsoons and large landslides (> 0.1 km2) since 1970. Adding inventories of Holocene, giant landslides (> 1 km3), and of landslides from the 2015 Gorkha earthquake, we constrain the size-frequency distribution of landslides induced by monsoons and earthquakes. They both contribute ~ 50 % to a long-term (> 10 kyr) total erosion of ~ 2 mm/yr, matching long-term exhumation rate. Large landslides, rarer than 10Be sampling time, drive erosion. In Bangladesh, we measure how water and sediment move through tidal channels in an area heavily impacted by both sea level rise and the strategies that humans use to adapt. We found that the amount of water moving through the system is largely controlled by the strength of the tides, while the mass of sediment being transported is strongly connected to the season, and to a lesser extent the tides. These results are important for developing strategies to protect both human and natural landscapes. 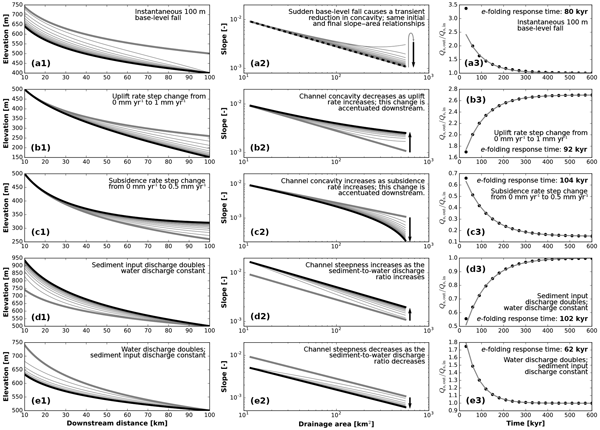 This paper reports the along-channel variability in occurring bed levels as described by hypsometry in natural estuaries. We found a novel relation between the estuary planform shape and the hypsometric function shape, which implies that it is possible to characterise and predict subwater estuarine morphology and bed levels in data-poor environments. Clast imbrication, which is a depositional fabric where clasts overlap each other similar to a run of toppled dominoes, is one of the most conspicuous sedimentary structures in coarse-grained fluvial deposits. However, the conditions leading to this fabric have been contested. Here, we calculate the hydrological conditions for various stream gradients. We find that clast imbrication most likely forms where channel gradients exceed a threshold and where upper flow regime conditions prevail. In this study we show how the Overijsselse Vecht river changed from a laterally stable to a meandering river ca. 500 years ago. We developed a methodology to reconstruct the historical discharge and found that the change in river style was caused by an increase in peak discharges. This increase was likely caused by the Little Ice Age and land use changes in the catchment (peat reclamation and exploitation). This study shows how river style changes as a result of discharge regime changes. Climate change will likely increase soil erosion in many locations worldwide. This increase in erosion will have large-scale impacts, such as the siltation of reservoirs. 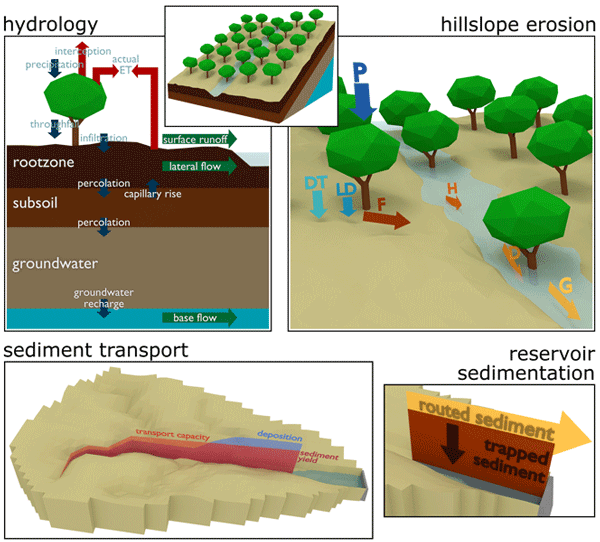 We developed a new soil erosion model to evaluate these impacts, which has an advantage over existing models in that it includes most relevant processes: rainfall–runoff generation, vegetation development, and soil erosion and deposition. The model is suited to perform scenario studies on climate change and land management. Coastal erosion is of major concern for society. Our study focused on rocky coasts, where coastal evolution remains poorly understood. We utilized the increasing number of erosion-related data and compiled them to better understand how and to what degree rocky coasts erode. We found that rock resistance primarily explained erosion rates, whilst the influence of the climate and sea was secondary. Weak rock coasts lose a median of 23 meters per century, about ten times more than hard rock coasts. In this paper, artificial model tests were used to observe the changes of soil moisture content and pore water pressure, as well as macroscopic and microscopic phenomena of gravel soil. In addition, the mathematical formula of the critical state was derived from the triaxial test data. Finally, the mechanical states of gravel soil were determined. In the process of landslide initiation, dilatation and contraction were two types of gravel soil state, but dilatation was dominant. We present 18 new cosmogenic radionuclide samples collected from modern river sand and dated Holocene terrace and floodplain deposits from the Ganga River at the Himalayan mountain front, which display a notable degree of temporal variability. This variability is explored using field observations and numerical and statistical analysis. 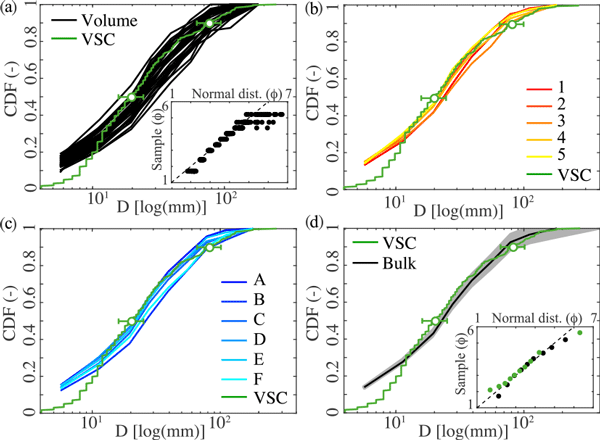 We propose that the observed variability is driven by the nature of stochastic inputs of sediment and the evacuation timescales of individual sediment deposits. What controls the size and shape of a river – its width, depth, and slope? The cross-sectional channel geometry of gravel-bedded rivers is understood to be a function of the river's fluid shear stress and the weight of the average particle on its bed; however, there is no satisfactory explanation for sand-bedded rivers. 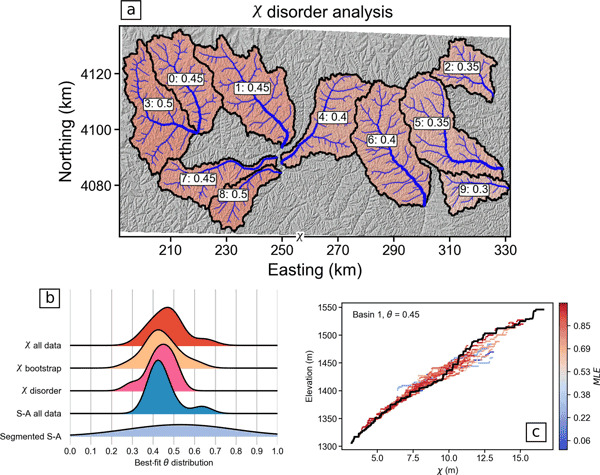 We analyze global datasets and individual river profiles and propose that accounting for riverbank cohesion could allow for an explanation for sand-bedded river channel geometry. 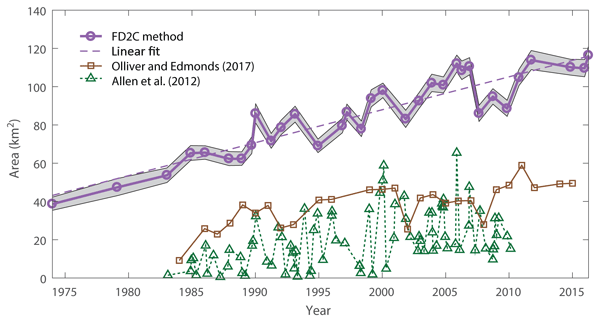 The new, free and easy-to-use tools in this paper (GEEDiT, GEEDiT-Reviewer and MaQiT) allow users to visualise, map and review margins from full satellite records of Landsat 4–8 and Sentinel 1–2 in addition to quantifying these margin changes with unprecedented speed. This allows previously prohibitive volumes of remote-sensing data to be analysed easily, flexibly and rapidly. These tools have potential applications across the geosciences for the exploration and analysis of satellite imagery. How concave are river channels? Rivers can reveal information about erosion rates, tectonics, and climate. In order to make meaningful inferences about these influences, one must be able to compare headwaters to downstream parts of the river network. We describe new methods for normalizing river steepness for drainage area to better understand how rivers record erosion rates in eroding landscapes. Channel bends and bars make up an important physical and ecological unit within rivers. Many riparian vegetation species need river bars for their life cycle, colonizing bars after flooding events. Once vegetation is established on bars, they can alter the flow and patterns of erosion and deposition. We used a hydraulic model to quantify the impact such riparian vegetation of various sizes and densities has on flow dynamics and inferred the expected changes in river erosion and deposition. On 21 July 2014, a voluminous landslide entered the caldera lake at Askja, Iceland, and created tsunami waves inundating famous tourist spots. The high hazard potential of the site motivated our study in which we analysed seismic data and found a precursory tremor signal intensifying in the 30 min before the landslide. 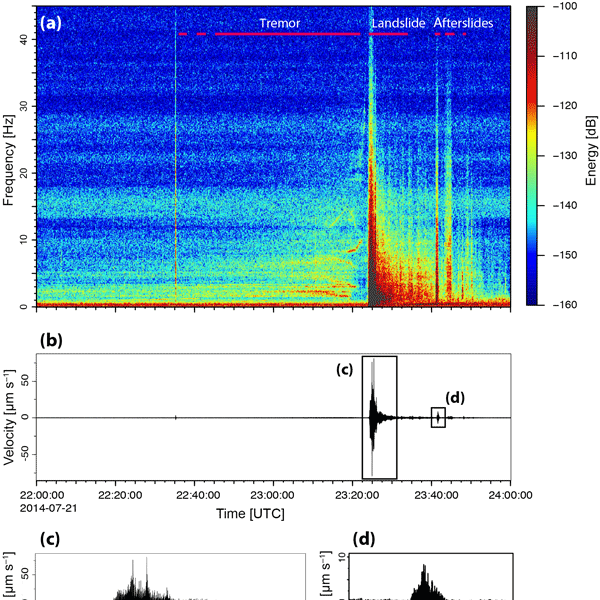 Our paper shows the potential of seismic monitoring techniques to detect precursory activity before a big landslide that could be used for an early-warning system. 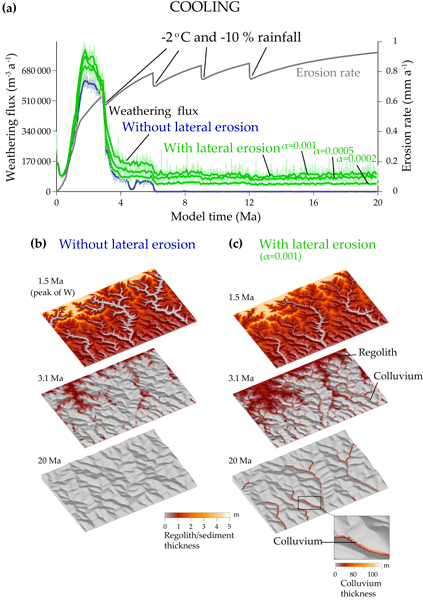 This paper presents applications of Structure-from-Motion Photogrammetry in a physical model of a braided river used to quantify morphology change and provide estimates of water depth, as well as image analysis for mapping bed surface texture. This research presents a new method for quantifying the geologic controls on modern barrier island evolution. 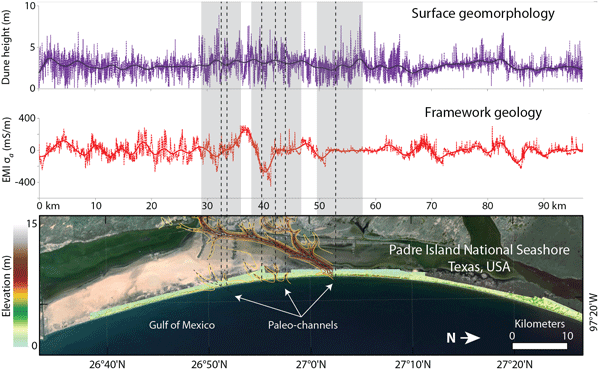 We used statistical time series analysis to evaluate the scale-dependent vs. scale-independent behavior of a barrier island in southern Texas, USA. By integrating subsurface geophysical with surface geomorphological measurements, we show that the island exhibits both free and forced evolutionary behavior that has important implications for how the island may respond to rising sea levels. Tracking the position of tracer particles entrained in a river is a popular method to investigate sediment transport. Using numerical simulations, we study the propagation of these tracers and find a transition between two regimes: an early regime in which the tracers are progressively set into motion and a late regime in which the tracers spread linearly. We derive analytical expressions for the behavior of the tracers in each regime. These expressions might help to interpret field data. Erosion by glaciers can limit the height to which mountains grow. The prevalence of this phenomenon is debated, and it is thought that glaciers only limit mountain height in temperate regions, where glaciers grow large during cold periods. We present evidence that glacial erosion has limited the rise of mountains in tropical Costa Rica and Taiwan, where glaciers are only intermittently present. Our work points to the remarkable efficiency of glacial erosion, even in the warmest places. The Ebro and Duero basins share a very common geological history. However, since the late Miocene, the Ebro basin has recorded important unfilling and excavation, whereas the Duero basin has only recorded limited incision and is considered to be still almost endorheic. Such a morphologic contrast led to important drainage reorganization and divide migration toward the Duero basin. Drainage area loss results in the lowering of the incision capacity of the Duero River, increasing this contrast. 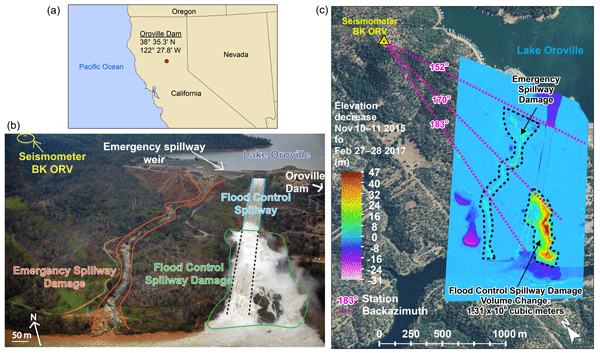 The Oroville Dam flood control spillway suffered catastrophic erosion damage in February 2017. We find that seismic waves recorded by a seismometer 2 km away contain information about the flow turbulence and damage location in the spillway. 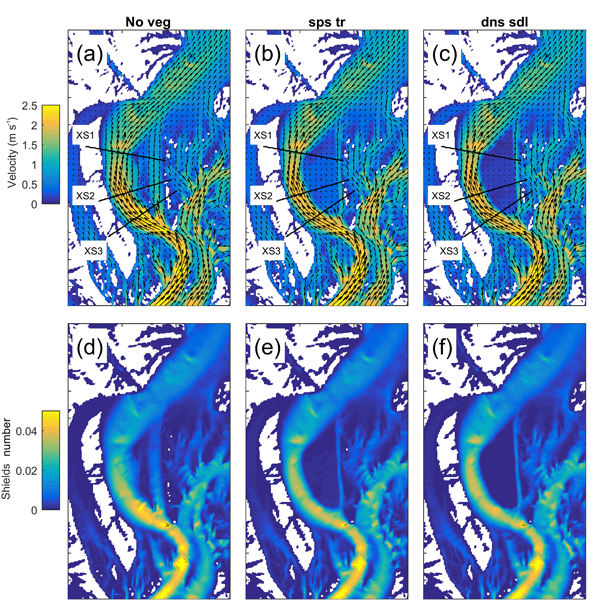 We show that enhanced turbulence due to spillway damage excites louder seismic waves at a given flow rate, which can be used to detect the onset and track the migration of erosion damage. The methods we use could be used to monitor other structures or rivers. Measurements of cosmogenic nuclides 10Be and 26Al in sediment along central Australian streams show that lithologically controlled magnitudes of source-area erosion rates (0.2–11 m Myr-1) are preserved downstream despite sediment mixing. Conversely, downstream-increasing sediment burial signals (> 400 kyr) indicate sediment incorporation from adjacent, long-exposed storages, which, combined with low sediment supply and discontinuous flux, likely favours source-area 10Be–26Al signal masking. We present a modelling framework for the prediction of gravel-bed braided river evolution. 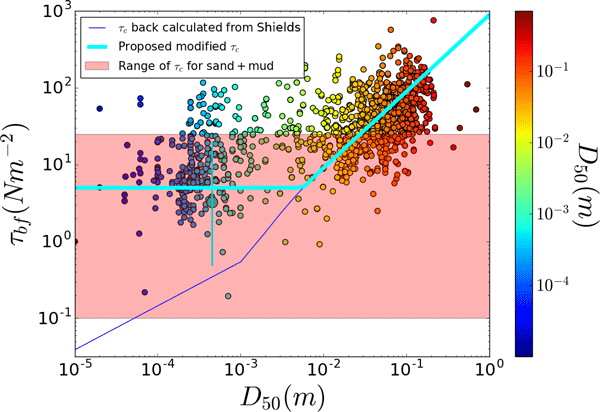 The model is unique in that it simplifies sediment transport through the use of empirically-derived relationships between channel form and flood-scale particle transport distances, or path lengths, which ultimately allow for longer duration model runs with reduced computational demand. 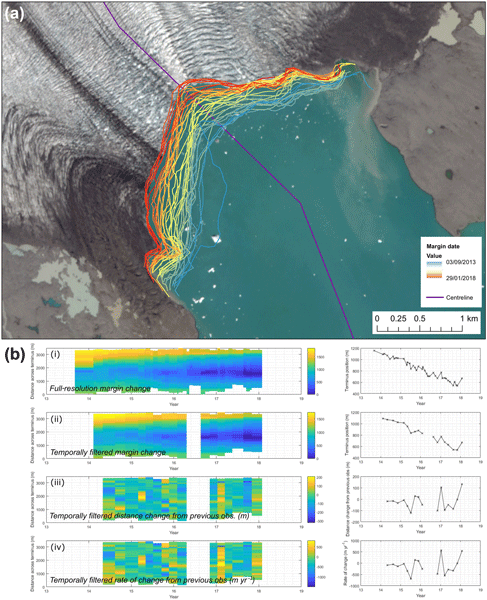 We use field surveys on two braided rivers to validate the model at the event, annual, and decadal timescales. The role of mountain uplift and associated silicate weathering in the global climate over geological times is controversial. Previous soil column models suggest that weathering falls at a high denudation rate. We present the results of a 3-D model that couples erosion and weathering, a CO2 consumer during mountain uplift. Our model suggests that the weathering of temporarily stocked colluvium may contribute significantly to the mountain weathering outflux at high denudation rates. 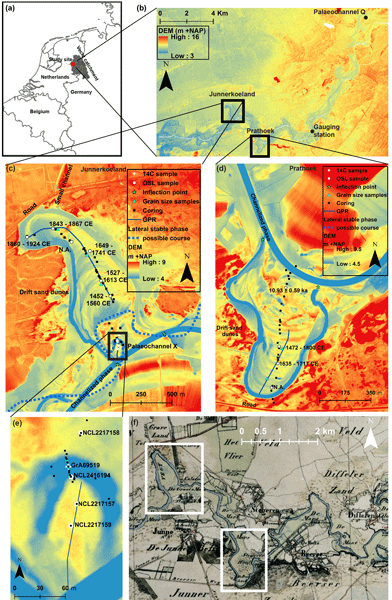 To study the effectiveness of river delta restoration, we used field observations and elevation data to quantify the magnitude and spatial patterns of aggradation and erosion in a restored wetland in the Rhine-Meuse delta. Erosion and aggradation rates decrease over time, but aggradation compensates for sea-level rise and soil subsidence. Channels in the centre had aggraded, whereas the inlet and outlet eroded. Furthermore, sediment is in general uniformly distributed over the intertidal area. 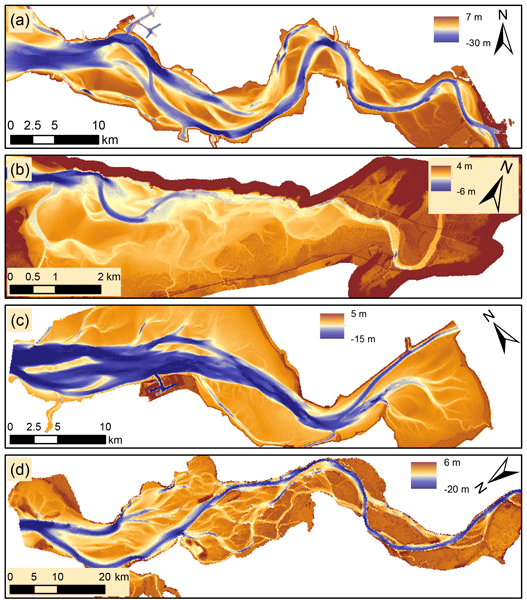 This paper analyses the timing of topographical changes of a gravel bed ephemeral river channel during consecutive and moderate- and low-magnitude floods by applying a morphodynamic model calibrated with pre- and post-event surveys using RTK-GPS and mobile laser scanning. The channel acted as a braided river during lower flows but as a meandering river during higher flows. The channel changes can be greater during the long-lasting receding phase than during the rising phase of the floods. We present a method to analyse surface change using 3-D data collected at hourly intervals. This is applied to 9000 surveys of a failing rock slope, acquired over 10 months. A higher proportion and frequency of small rockfall is observed than in less-frequent (e.g. monthly) monitoring. 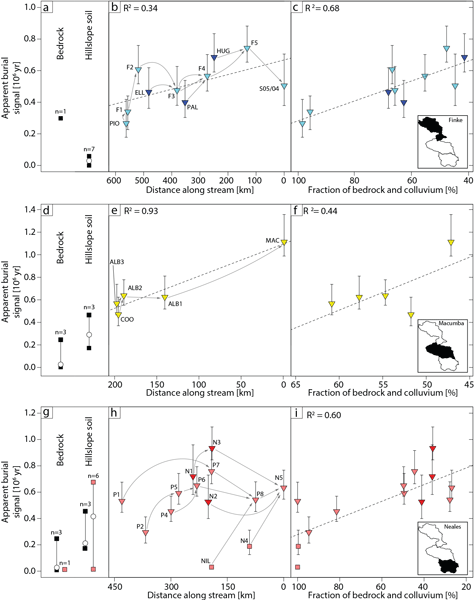 However, quantifying longer-term erosion rates may be more suited to less-frequent data collection, which contains lower accumulative errors due to the number of surveys and the lower proportion of small events. We develop a model of annual probability of shallow landslide initiation triggered by soil water from a hydrologic model. Our physically based model accommodates data uncertainty using a Monte Carlo approach. 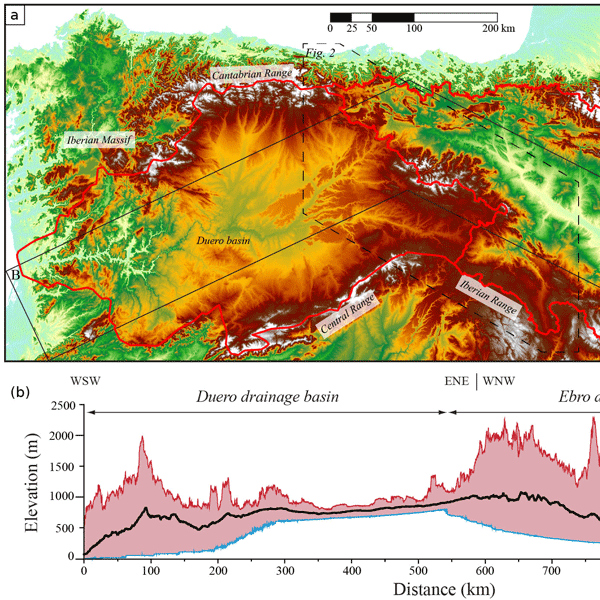 We found elevation-dependent patterns in probability related to the stabilizing effect of forests and soil and slope limitation at high elevations. We demonstrate our model in Washington, USA, but it is designed to run elsewhere with available data for risk planning using the Landlab. Bedrock channels are a key component of mountainous landscapes. Here, a new model of the steady-state morphology, including channel width, slope and sinuosity, is derived from process physics considerations. 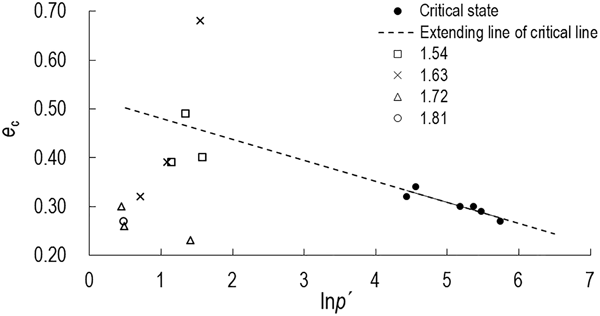 The model compares favourably to observed scaling relations. A reconstruction of erosion in the core monsoon zone of India provides unintuitive but fundamental insights: in contrast to semiarid regions that experience enhanced erosion during erratic rain events, the monsoon is annual and acts as a veritable erosional pump accelerating when the land cover is minimal. The existence of such a monsoon erosional pump promises to reconcile conflicting views on the land–sea sediment and carbon transfer as well as the monsoon evolution on longer timescales. Rockfall is an essential geomorphic process and a hazard in steep landscapes which is hard to constrain with traditional approaches. Seismic methods allow for the detection, location, characterisation and linking of events to triggers by lag times. 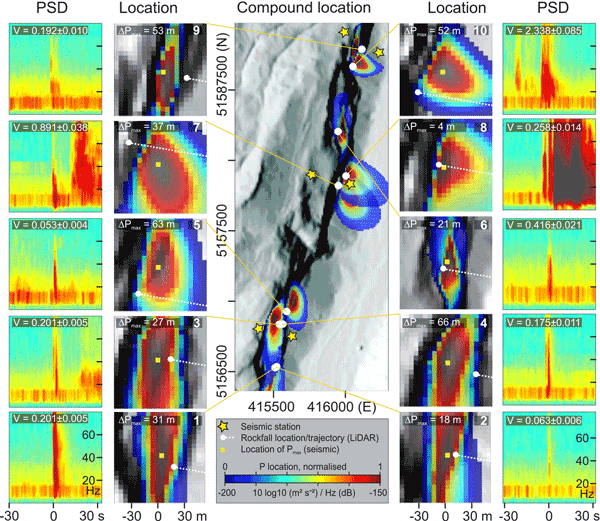 This new technique reveals 49 rockfalls in 6 months with seasonally varying locations. Freeze–thaw action accounts for only 5 events, whereas 19 rockfalls were caused by rain with a 1 h peak lag time, and 17 events were due to diurnal thermal forcing. Creating estuaries in the laboratory has been challenging. When the ebb and flood currents are driven by ebb and flood in the sea, they are too weak to move sand. 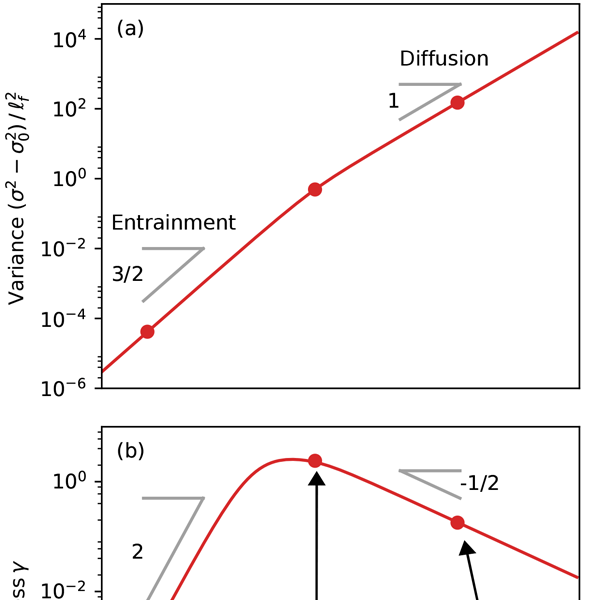 Here we describe how the periodic tilting of an entire experimental set-up leads to ebb and flood currents with similar behaviour as in nature and with enough strength to move sand. This means that this novel set-up now allows for the creation of estuarine landscapes in experiments. The Swiss plate geophone system is a bedload surrogate measuring technique. Calibration measurements for this technique were performed in two mountain streams in Austria, using geophone impulse rates (a summary value) and directly measured bedload transport rates. Implausible geophone impulse counts are discussed that were recorded during periods with smaller discharges without any bedload transport, and that are likely caused by vehicle movement very near to the measuring sites. We use a seismometer network to detect and locate rockfalls, a key process shaping steep mountain landscapes. When tested against laser scan surveys, all seismically detected events could be located with an average deviation of 81 m. Seismic monitoring provides insight to the dynamics of individual rockfalls, which can be as small as 0.0053 m3. Thus, seismic methods provide unprecedented temporal, spatial and kinematic details about this important process. Mud raises concern in the short-term management of estuaries, but it is not known whether cohesive mud affects the long-term development of estuaries. We discovered that a small supply of mud from the river confines the estuary by forming stable mudflats on the sides in centuries, whereas estuaries with only sand continue to grow. Mudflats also reduce the shifting of channels and bars. This implies that changes in mud supply in estuaries may have led to changes in shape and dynamics in the past. The Ebro Delta in Spain has a distinctive coastline shape, the origin of which has been debated. Here we show with two simple models, one of the Ebro River and one of its delta, that is it possible to reproduce this distinctive shape under constant sediment supply, wave climate, and sea-level conditions. We also find that the majority of the delta grew in the last 2000 years, when a great increase in sediment supply from the Ebro River allowed it to accelerate its growth. 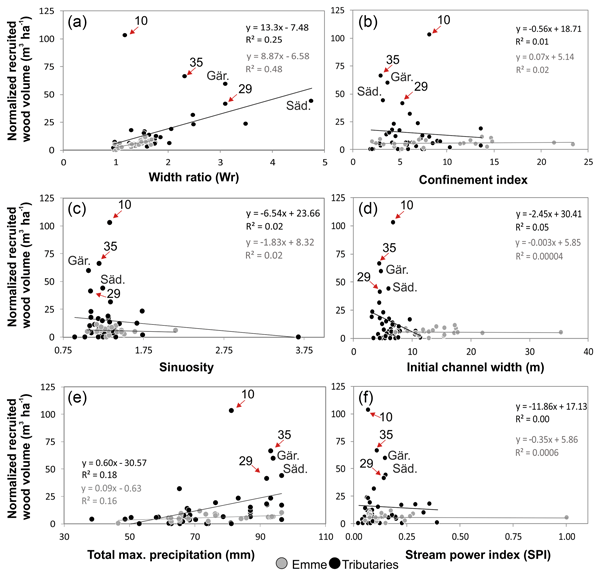 This paper focuses on the analysis of the properties controlling the grain size in the streams of the western Peruvian Andes. Pebble size distributions in these streams have been compared to fluvial processes and basin properties. The resulting trends and differences in sediment properties seem to have been controlled by threshold conditions upon supply and transport. Researchers of fluvial geomorphology require reliable information on channel width and its change in space and time. For example, to study bank erosion rates we need the local position of channel banks before and after a high flood event. Although deriving these metrics seems simple, researchers often use manual or arbitrary approaches that are not objective and reproducible. Here, we present an open-source software tool cmgo (R package) that meets the requirements of academic research. We demonstrate that the world's largest beach-ridge plain in southern Mexico was formed under an ample long-term fluvial sediment supply. The beach-ridge elevation is strongly influenced by aeolian accretion during the time when the ridge is located next to the beach. 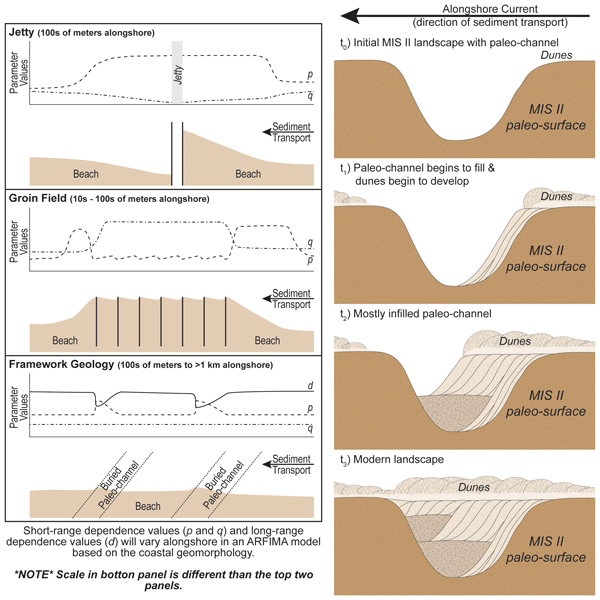 The beach-ridge elevation is negatively correlated with the progradation rate, which we relate to the variability in sediment supply to the coastal zone, reflecting decadal-scale precipitation changes within the river catchment. Quantitative analysis of digital topography is an important part of many modern geologic investigations. We have constructed a series of software tools, the Topographic Analysis Kit (TAK), built on top of the existing TopoToolbox library, to allow for efficient and easy analysis of topography that limits the required computing and domain-specific knowledge necessary to successfully produce robust analyses of topographic data.